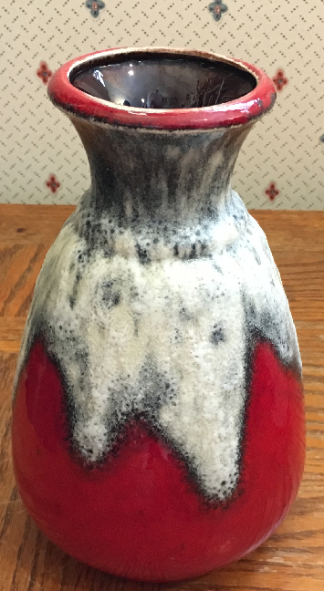 This Bay Keramik vase has fairly simple, clean lines with good proportions and just enough flair and variation to add interest in both the form and how the glaze flows. 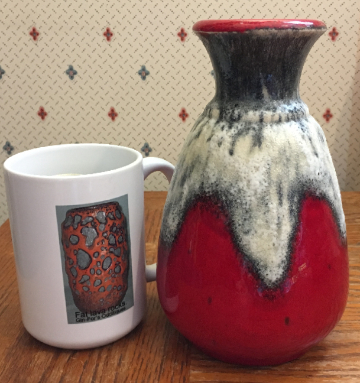 It features a strong but not harsh red glaze with a black and white to cream overglaze that varies in thickness and includes a bit of volcanic bubbling in the thickest, whitest areas. Personally, I wouldn't quite call it fat lava, but it's moving in that direction. Shape is number 66 and about 20cm. 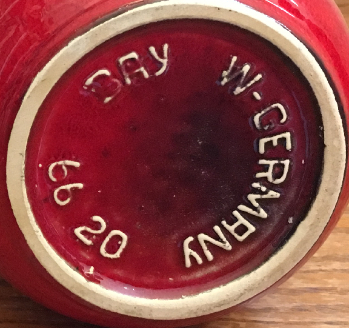 I would guess late 60s for date of origin. Size: Height is about 7 3/4".